The iPhone 7 is here, and gone is the headphone jack. While Apple is bundling each new iPhone 7 and 7 Plus with Lightning-based EarPods and a Lightning to 3.5mm headphone jack adapter, the company hasn’t provided a solution to one common use case: How do you listen to music with headphones and charge your phone at the same time? Belkin’s latest adapter solves that problem—the Lightning Audio + Charge RockStar will allow you to do both simultaneously. This device plugs into your iPhone’s Lightning port, and includes two Lightning ports on the other end to plug in your EarPods and your charging cable. Belkin says that the adapter will work with all Lightning Audio products—not just Apple’s—and is also compatible with all iPhone 7 cases. It also works with battery packs and cases, including Apple’s iPhone 7 Smart Battery Case. It doesn’t have a traditional 3.5mm headphone jack, so if you want to use an older pair of headphones, you’ll still need that headphone adapter from Apple. The Lightning Audio + Charge RockStar looks a little bulky, but should do the trick. We haven’t had a chance to check it out in person, but we’ll certainly review it once it ships. It will be available on October 10 for $40 in Apple stores (both retail and online) and Belkin’s website. Why this matters: Ditching the headphone jack was a bold move on Apple’s part (or perhaps courageous is a better word choice). Providing new headphones and adapters alongside the iPhone 7 will help us with the transition over to Lightning Audio, but isn’t an overall solution. Apple has often left it up to third-party creators to provide better alternatives, as is the case with Belkin’s latest adapter. 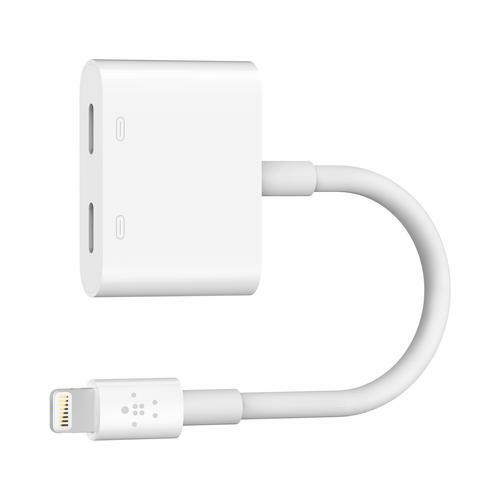 There’s bound to be more Lightning Audio accessories and adapters just around the corner.